When people hear about the consumption of small cetaceans such as dolphins and porpoises, the first thing that normally comes to their minds are the well-known dolphin hunts that still occur in some coastal areas of Japan or the “Grindadráp”, name given in the Faroe Islands to the hunt of pilot whales and other dolphin species. However, the exploitation of small cetaceans and other aquatic mammals for food and other purposes is not an isolated event that takes place in a few countries, but is a common activity in many countries worldwide and, in most cases, is illegal or unregulated. The products derived from big aquatic animals are known as ‘aquatic wild meat’. These products are used for food as well as bait, traditional medicine, and religious ceremonies, and are obtained through illegal or unregulated hunts, although they can be obtained opportunistically as well, from stranded animals and those accidentally caught in fishing gears. In general, this utilisation begins by chance, however, the demand in some areas has expanded and it is growing leading to deliberate hunts, putting some populations at risk. Collecting data on aquatic wild meat is intrinsically difficult given that much of the processing occurs offshore, illicitly, or away from centralised food markets. 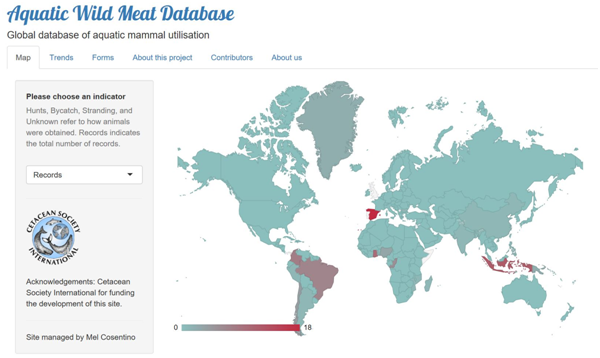 The Aquatic Wild Meat Database aims to centralise available data on aquatic mammal utilisation at a global scale. The idea emerged from a group of scientist and then carried out by Mel Cosentino, a conservation biologist who has a special interest in the impact of human activities on marine mammals. Mel joined forces with Lucrecia Souviron Priego, a biologist currently finishing her PhD on the International wildlife trade at the University of Málaga. Aquatic Wild Meat Database home page. The picture shows a world map colour-coded by number of records per country. The database contains data of different types or quality that have been collected opportunistically or systematically and the final goal is use these data to answer different questions. The Aquatic Wild Meat Database was presented by Mel at the 70th annual meeting of the Scientific Committee of the International Whaling Commission Scientific Committee, which was held in Bled, Slovenia, earlier this year. The idea was discussed with scientists specialised in this field from around the world, who will work with us to continue to improve and populate the database. The development of the application was possible thanks to the support of the Cetacean Society International and ODYSSEA, which funded the application in its early stages; the project was also supported by Oceancare and the Animal Welfare Institute. The alpha version was posted online last year, and it has been updated and improved since then. Technical support is provided by Momchil Vasilev. Mel studied the impact of whale watching on sperm whales. Read about Félix's experience at MICS. Lisez plus sur les travaux de l'équipe. Amandine et Anna ont présenté des posters à l'ECS. With only 30 left, can they be saved? Stage de recherche sur baleines au Canada.